The Nokia Lumia 530 is the affordable smartphone in the Lumia range, so here I take it through its paces to see how it performs. The phone is relatively light at 129g and the build feels a little cheap due to the plastic construction but you get used to it after a while. The bright back cover is one solid piece of plastic that extends around the curved edges of the phone which is actually a nice touch. The large bezel around the display makes the screen look a little small but the screen is actually quite crisp and delivers a decent performance when gaming or browsing websites. The overall design and casing of the phone sits nicely in the hand and the on screen navigation buttons are responsive. 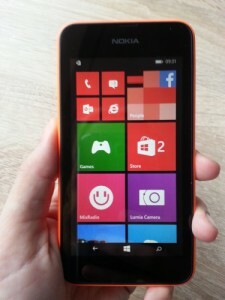 The Nokia Lumia 530 is running Windows Phone 8.1 which gives you the Live Tiles homescreen which updates with notifications on screen. Setting the phone up is easy allowing you to add all your accounts for email, social networks and instant messaging easily. The free Nokia MixRadio app is great for music lovers as it allows you to select a number of artists or choose some of your favourite songs and the app will play a mix of songs for you, and the speakers delivered a surprisingly decent sound too. Nokia Maps is on board and the screen delivers good graphical quality to the maps making them easy to follow and very easy to set up routes or get directions to a chosen destination. As this is a Windows Phone you get access to Xbox Games which can be linked to your existing Xbox account. There are plenty of games to choose from on the Games store and the screen is bright and clear when playing games. Microsoft Office and OneDrive are pre-installed so this phone can be used to create documents and share files, although the small screen doesn’t lend itself well to long periods of editing but quick changes or updates are OK. The battery lasted a good amount of time through mixed use even with Wi-Fi constantly switched on and when first connected to a laptop for a recharge the phone automatically loads the software needed onto the computer so syncing files is quick and easy. The phone is packing a 5-megapixel camera so I wasn’t expecting great results and the lens did struggle in low light conditions. The captured shots didn’t look particularly good on the phone screen but they appeared to be a much better quality when uploaded to a computer. The Lumia camera app can be downloaded to give you a world of editing options and there are a number of tutorials on the phone to help you get to grips with the different settings that can be altered to suit your subject. Video records at 480p so the quality of capture can be poor sometimes but the results are good enough considering this is a budget smartphone. The Nokia Lumia 530 is actually not a bad phone to use, once you get past the plastic feel the phone screen is actually very good for a budget phone. The fun colourful cases and features such as MixRadio and good music sound will appeal to younger smartphone fans and with a price tag of just £49.99 on pay as you go this phone more than delivers at that price. This is the perfect phone for a first time smartphone user or if you are looking for a phone with smartphone features at a bargain price.